It's been a good week for unusual wildlife. 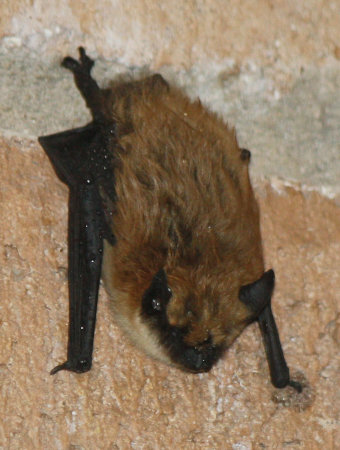 We got a surprise a few nights ago when flipping the porch light on to take the trash out: a bat was clinging to the wall just outside the front door. It was tiny, and very calm -- so motionless we feared it was dead. (I took advantage of this to run inside and grab the camera.) It didn't move at all while we were there. The trash mission accomplished, we turned out the light and left the bat alone. Happily, it wasn't ill or dead: it was gone a few hours later. We see bats fairly regularly flying back and forth across the patio early on summer evenings -- insects are apparently attracted to the light visible through the windows from inside, and the bats follow the insects. But this was the first close look I'd had at a stationary bat, and my first chance to photograph one. I'm not completely sure what sort of bat it is: almost certainly some species of Myotis (mouse-eared bats), and most likely M. yumanensis, the "little brown bat". It's hard to be sure, though, as there are at least six species of Myotis known in the area. We've had several woodrats recently try to set up house near the house or the engine compartment of our Rav4, so we've been setting traps regularly. 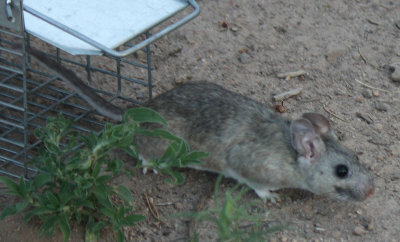 Though woodrats are usually nocturnal, we caught one in broad daylight as it explored the area around our garden pond. But the small patio outside the den seems to be a particular draw for them, maybe because it has a wooden deck with a nice dark space under it for a rat to hide. We have one who's been leaving offerings -- pine cones, twigs, leaves -- just outside the door (and less charming rat droppings nearby), so one night Dave set three traps all on that deck. I heard one trap clank shut in the middle of the night, but when I checked in the morning, two traps were sprung without any occupants and the third was still open. But later that morning, I heard rattling from outside the door. 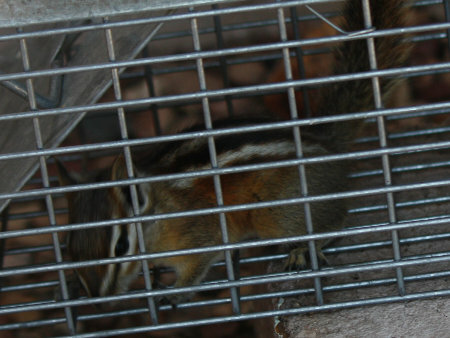 Sure enough, the third trap was occupied and the occupant was darting between one end and the other, trying to get out. I told Dave we'd caught the rat, and we prepared to drive it out to the parkland where we've been releasing them. 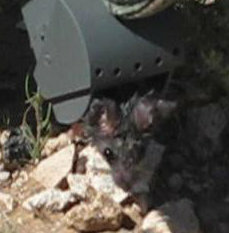 And then I picked up the trap, looked in -- and discovered it was a pretty funny looking woodrat. With a furry tail and stripes. A chipmunk! We've been so envious of the folks who live out on the canyon rim and are overloaded with chipmunks ... this is only the second time we've seen here, and now it's probably too spooked to stick around. We released it near the woodpile, but it ran off away from the house. Our only hope for its return is that it remembers the nice peanut butter snack it got here. Later that day, we were on our way out the door, late for a meeting, when I spotted a small lizard in the den. (How did it get in?) Fast and lithe and purple-tailed, it skittered under the sofa as soon as it saw us heading its way. But the den is a small room and the lizard had nowhere to go. After upending the sofa and moving a couple of tables, we cornered it by the door, and I was able to trap it in my hands without any damage to its tail. When I let it go on the rocks outside, it calmed down immediately, giving me time to run for the camera. 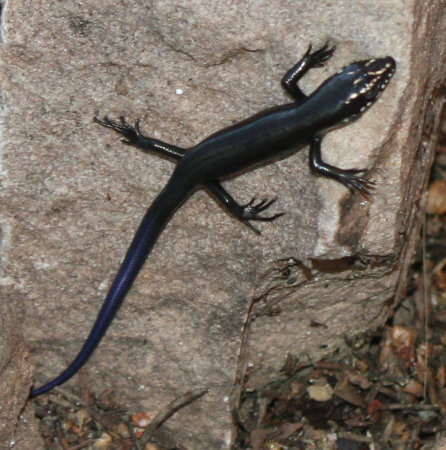 Its gorgeous purple tail doesn't show very well, but at least the photo was good enough to identify it as a juvenile Great Plains skink. The adults look more like Jabba the Hut nothing like the lovely little juvenile we saw. We actually saw an adult this spring (outside), when we were clearing out a thick weed patch and disturbed a skink from its hibernation. And how did this poor lizard get saddled with a scientfic name of Eumeces obsoletus? I went out this morning to check the traps, and found the mousetrap full ... of something large and not at all mouse-like. The snake watched me alertly as I peered in, but it didn't seem especially perturbed to be trapped. 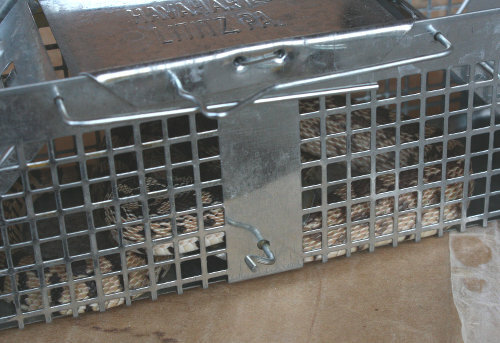 In fact, it was so non-perturbed that when I opened the trap, the snake stayed right where it was. It had found a nice comfortable resting place, and it wasn't very interested in moving on a cold morning. I had to poke it gently through the bars, hold the trap vertically and shake for a while before the snake grudgingly let go and slithered out onto the ground. I wondered if it had found its way into the trap by chasing a mouse, but I didn't see any swellings that looked like it had eaten recently. I'm fairly sure it wasn't interested in the peanut butter bait. I released the snake in a spot near the shed where the mousetrap is set up. There are certainly plenty of mice there for it to eat, and gophers when it gets a little larger, and there are lots of nice black basalt boulders to use for warming up in the morning, and gopher holes to hide in. I hope it sticks around -- gopher/bullsnakes are good neighbors. We caught another mouse! I shot a movie of its release. Like the previous mouse we'd caught, it was nervous about coming out of the trap: it poked its nose out, but didn't want to come the rest of the way. Dave finally got impatient, picked up the trap and turned it opening down, so the mouse would slide out. 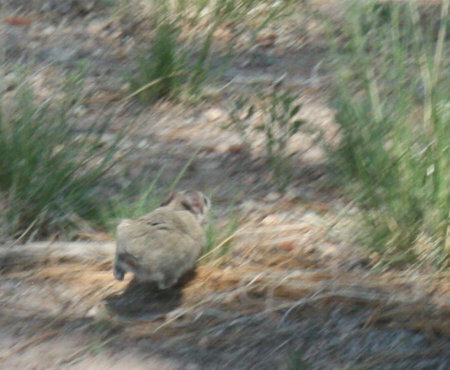 Then it headed up the hill a ways before finally lapsing into the high-bounding behavior we've seen from other mice and rats we've released. I know it's hard to tell in the last picture -- the photo is so small -- but look at the distance between the mouse and its shadow on the ground. Very entertaining! I don't understand why anyone uses killing traps -- even if you aren't bothered by killing things unnecessarily, the entertainment we get from watching the releases is worth any slight extra hassle of using the live traps. Here's the movie: Mouse released from trap. One great thing about living in the country: the wildlife. I love watching animals and trying to photograph them. One down side of living in the country: the wildlife. Mice in the house! Pack rats in the shed and the crawlspace! We found out pretty quickly that we needed to learn about traps. We looked at traps at the local hardware store. Dave assumed we'd get simple snap-traps, but I wanted to try other options first. I'd prefer to avoid killing if I don't have to, especially killing in what sounds like a painful way. They only had one live mousetrap. It was a flimsy plastic thing, and we were both skeptical that it would work. We made a deal: we'd try two of them for a week or two, and when (not if) they didn't work, then we'd get some snap-traps. We baited the traps with peanut butter and left them in the areas where we'd seen mice. On the second morning, one of the traps had been sprung, and sure enough, there was a mouse inside! Or at least a bit of fur, bunched up at the far inside end of the trap. We drove it out to open country across the highway, away from houses. I opened the trap, and ... nothing. I looked in -- yep, there was still a furball in there. Had we somehow killed it, even in this seemingly humane trap? I pointed the open end down and shook the trap. Nothing came out. I shook harder, looked again, shook some more. And suddenly the mouse burst out of the plastic box and went HOP-HOP-HOPping across the grass away from us, bounding like a tiny kangaroo over tufts of grass, leaving us both giggling madly. The entertainment alone was worth the price of the traps. Since then we've seen no evidence of mice inside, and neither of the traps has been sprung again. So our upstairs and downstairs mice must have been the same mouse. We bought the traps, adjusted one a bit where its trigger mechanism was bent, baited them with peanut butter and set them in likely locations. About four days later, we had our first captive little brown furball. Much smaller than some of the woodrats we've seen; probably just a youngster. We drove quite a bit farther than we had for the mouse. 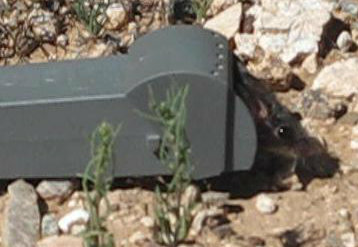 Woodrats can apparently range over a fairly wide area, and we didn't want to let it go near houses. We hiked a little way out on a trail, put the trap down and opened both doors. 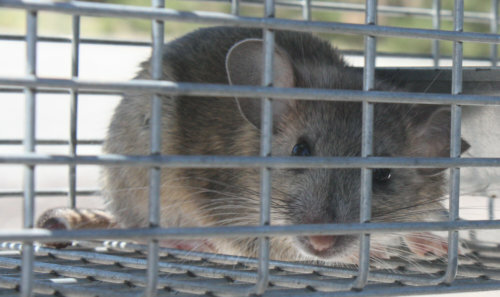 The woodrat looked up, walked to one open end of the trap, decided that looked too scary; walked to the other open end, decided that looked too scary too; and retreated back to the middle of the trap. 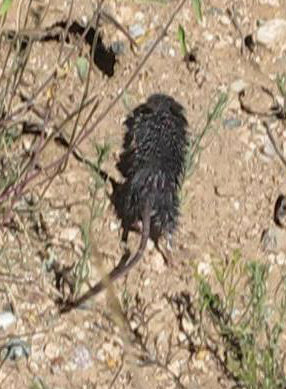 We had to tilt and shake the trap a bit, but eventually the woodrat gathered up its courage, chose a side, darted out and HOP-HOP-HOPped away into the bunchgrass, just like the mouse had. No reference I've found says anything about woodrats hopping, but the mouse did that too. I guess hopping is just what you do when you're a rodent suddenly set free. I was only able to snap one picture before it disappeared. It's not in focus, but at least I managed to catch it with both hind legs off the ground.